"This easy gourmet sandwich is so good, you would serve it to the president if you had him over for dinner. As far as grilled cheese goes, this is it! Serve with a nice gourmet Italian salad." In a small bowl, mash together the butter and Parmesan cheese until evenly blended. 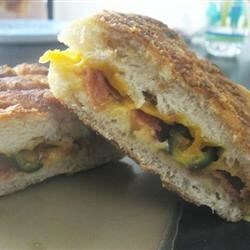 Make sandwiches by placing two slices of bacon and one slice of Cheddar cheese on half of the bread slices. Top with the remaining slices of bread. Heat a large skillet over medium heat. Spread some of the butter mixture on the top of each sandwich. Place sandwiches butter side down in the skillet. Spread the remaining butter mixture on the other sides. Cook until golden brown on each side, about 3 minutes per side. To serve, cut in half diagonally. Tried it with white bread and the family didnt really like new taste of this recipe compared to the classic. Didnt have garlic powder, so I tried using minced garlic. This was a nice twist on the standard grilled cheese. Grown ups and kids both really liked this one. after having this, bacon on grilled cheese will be a must! I used a foccacia bread and added some sliced jalapenos in the mix too. Yum! Yummy-nummy! This definitely brought out the kid in me. Perfect grilled cheese. My family loved these. I added thinly sliced Virgina ham to them. These are really very good.